Specialized arterial vessels in the umbilical cord. They carry waste and deoxygenated blood from the FETUS to the mother via the PLACENTA. In humans, there are usually two umbilical arteries but sometimes one. 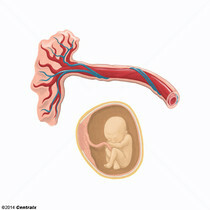 Venous vessels in the umbilical cord. They carry oxygenated, nutrient-rich blood from the mother to the FETUS via the PLACENTA. In humans, there is normally one umbilical vein. 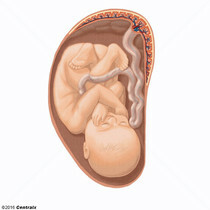 The flexible rope-like structure that connects a developing FETUS to the PLACENTA in mammals. The cord contains blood vessels which carry oxygen and nutrients from the mother to the fetus and waste products away from the fetus.